While the world's countries had just gathered in Marrakech to discuss the implementation of the Paris agreement, news broke that Donald Trump was elected president of the United States. He doesn't believe in climate change; it's a conspiracy by the Chinese, he says. Is the Paris agreement, two weeks after going into force, already a failure? Perhaps it won’t be a catastrophe. 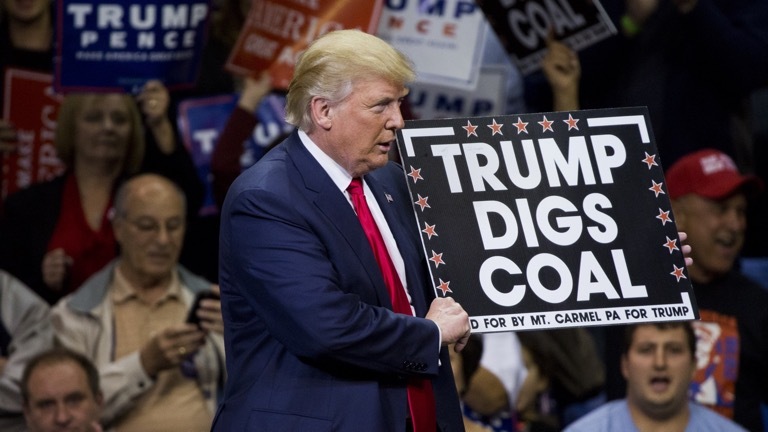 In last Monday’s issue of Klassekampen, Steinar Andresen rightfully noted that it's not that easy to leave international treaties, and economic realities make it unlikely that Trump will be able to save the coal industry, which he promised. Admittedly, I am also hoping it will not be too bad. But if the election campaign has taught us anything, it's that the danger that Donald Trump represents should not be underestimated. That's exactly what the other republican candidates, and the media, did during the primaries: They thought his candidacy was a joke. That he was only doing it to get media attention. And if he truly wanted to become president, that he would shift towards the center during the general election. But that didn't happen. And as president it won’t happen either. As for his intentions on climate, we don't need to look further than the people he surrounded himself with to fear for the worst. Back in 2001, Trump's running mate Mike Pence called climate change a myth, because – according to him – the earth had been warmer fifty years before. Unfortunately, such a bizarre reversal of the facts isn’t unusual for the new vice president: In the same year, he said smoking doesn't kill. Moreover, Trump has appointed the climate denier Myron Ebell as head of his transition team for the Environmental Protection Agency. This federal agency will be subject to the whims of a man who ten years ago in Forbes magazine wrote that climate change, even if it existed, would be no problem at all. According to him, an increase in heat waves would only be lethal to people who were about to die anyway. And if everybody bought air conditioning, it wouldn't be an issue at all. So, the intentions of Trump and his team are crystal clear. Rather than investing in solar, wind and water energy, they want to extract all the oil, gas and coal from the ground to create jobs and become energy independent. Ironically, a lot of new jobs are created by the growth of renewable energy, which is already cheaper than coal. Put differently: If Donald Trump is serious about combining energy independence with job growth, for the best possible price, he should embrace the green energy revolution, not stop it. But reality doesn't matter in Trumpland. Image is everything. Although the Paris agreement is non-binding – the new American government could simply ignore it – they want to make a symbolic statement. It's very likely that the United States will leave the UN climate convention, as a source close to Trump revealed to Reuters this week. Donald Trump bets on coal. If he wants to create jobs and become energy independent, he would do better by embracing renewable energy. It may sound strange but if the USA leaves the UN climate convention, this would be bad, but not the worst-case scenario. When George W. Bush didn't do so during his presidency, the USA frustrated negotiations for eight long years, and progress stalled. Time we couldn't afford to squander. If an exit by the USA is not followed by other countries, the rest of the world, without Trump, can make a strong push to solve the climate problem. After all, the USA contributes 'only' 15 percent to global emissions. It's hopeful that worldwide emissions haven't risen for three years in a row, despite strong economic growth. And this is due to changes in China, not the USA. Climate change is of course just one among many issues I'm worried about after an election filled with horrible remarks and an unprecedented denial of the facts. Seen that way, I am beginning to better understand voters on the other side of the political spectrum, how they felt eight years ago. Back then I was sitting in a cab in Fairbanks, Alaska, after a couple of weeks of fieldwork measuring methane emissions from thaw lakes on the tundra. Obama had just been elected president, and the cab driver was terrified for the future. Death panels that would decide who should get health care. The repeal of the right to bear arms. Those things. "Don't worry", I said. "He won't be very different from previous presidents". The cab driver seemed unconvinced, but by now it's become clear that his worst fears were unwarranted. Unfortunately, now that the tables have turned, Trump doesn't give me a single reason to be so reassuring this time around.